France is about to withhold its support for the Nord Stream 2 project, according to a report in the German daily Süddeutsche Zeitung. The natural gas pipeline, a third of which is already laid across the Baltic Sea seabed, is a massive European project and would directly connect Russia to Germany, bypassing Ukraine and Poland. By some it has been seen as yet another contribution to energy security, by others as a geopolitical tool. It depends where you live. Technically not a European Union project, up to this point Germany has had the support of Austria, Belgium, Cyprus, France, Greece and the Netherlands for the pipeline. If Paris is really about to abandon support, it could have grave effects for the 1,230 kilometer (764 mile) project since the countries work so closely together. Strangely enough, it is the distant Americans that have been loudest in their protest. And this resistance has only grown louder since Donald Trump took over the reins in Washington. Since arriving in Germany in May 2018, his US ambassador in Berlin, Richard Grenell, has continuously mixed in his host country’s affairs. It was a break with long-standing protocol and annoyed many German businesses. Earlier this month it was reported that he escalated the Nord Stream 2 debate by sending threatening letters to German companies working on the pipeline. Critics of those remarks point out that the US probably has its own business interests at heart as American companies would be more than happy to sell their own liquid gas to many European countries. DW earlier reported that German Economics Minister Peter Altmaier hadn’t ruled out importing from the US, but only as a supplement to Russian gas, and very importantly only if the price was right. This was surely not enough for Washington. But can such a huge multi-national project be stopped, especially by a country not even directly involved? 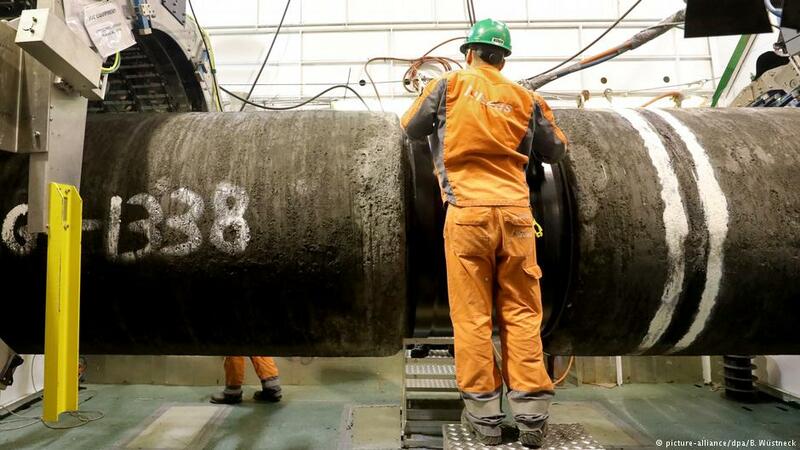 In reality the Nord Stream 2 pipeline is actually two parallel pipes each of which has an internal diameter of 1.2 meters (4 feet). Ironically it closely follows the path of Nord Stream 1, a similar project in operation since 2011 that doesn’t seem to bother anyone at the moment. As planned the new pipeline will be 1,230 kilometers and meander through the maritime waters of Finland, Sweden and Denmark before landing in northeastern Germany. By the end of last year, 370 kilometers of pipeline had been put in place. And at the end of January, Klaus Haussmann, an engineer working at the pipeline’s future landfall site in Greifswald, told public radio station Deutschlandfunk that the “raw” laying of the pipeline was scheduled to be finished by the middle of the year. After that, electrical equipment would be installed and gas could be flowing by November. So much has been invested and major environmental damage has already been done. Can the fears of Ukraine, Lithuania and Poland — and the US — put an end to a pipeline that is nearing completion? The answer could be: yes. In the past two years, the US has taken on its closest allies and companies that it doesn’t like. As we have seen recently with the trade conflict between China and the US, America is willing to hurt itself to make a point and try to get a leg up. It has often been accused of putting its business interests at the forefront instead of the moral arguments it claims, especially when it comes to huge financial fines on banks and companies accused of breaking US sanctions. Once again this fight is about business, influence peddling and shows of strength. It could even be about Nord Stream AG, the company behind the pipeline whose biggest shareholder is Russia’s Gazprom. Whatever it is, the US has shown the lengths it is willing to go to in order to make a point no matter the broader consequences.